The local ACE hardware had a recent sale and so I went ahead and bought a pruning saw. We've never had a pruning saw at home before. The garden tools we use for cutting off tree limbs were either pruning shears, machete or even a hacksaw. For deadheading flowers, I use pruning shears and garden pruning scissors. Pruning shears are also fine for twigs and plant stems that around 1/4" thick and below. Anything thicker would call for a heftier garden tool. But I don't want to carry around a regular saw to do the job. This is where a foldable pruning saw would be handy. 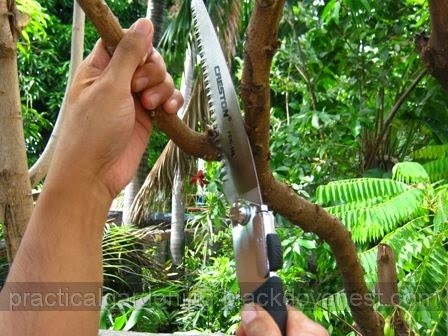 For many, using a machete is the only tool to use when cutting thick branches. Maybe hacking away with this traditional tool gives a feeling of power. Or being able to unleash pent-up emotions akin to punching a heavy bag in the gym. A sharp machete is certainly a joy to use especially if razor sharp. By this, I mean the sharpness that would instantly cut a 1-inch thick mature mango tree branch in one swoop. Otherwise, hacking away seems agonizingly slow. You'd get bits of tree branch chips flying in all directions, including your face. And the resulting cut, if you didn't manage to split the remaining branch, looks like something that was chewed by your cat. Of course you also need plenty of elbow (and arm) room to gain a good swing and chop the the branches. Not only does it rattle and jar the plant, the exercise sends out the familiar whacking sound. Machetes have their place in clearing tree limbs and coarse vegetation, but I was looking for something handy for use around the garden. Here's a longtime favorite of mine. Rather than chop or hack a tree branch, wouldn't it be simpler to "slice" it off? That's how I'd compare the cutting motions. Sawing branches with a hacksaw slices timber similar to slicing butter - not that easily of course. But using a hacksaw to saw off branches is quieter, and gives a cleaner cut for the branch. You could even cut tree branches in cramped spaces. As long as there's ample room for a hacksaw moving to and fro, a hacksaw would be the tool of choice for me. The cutting blade I use is actually that used hereabouts for metal. It's widely available from all hardware stores so I've had no problems getting it. I use the blade until I break it. I don't worry about it getting blunt because tree or plant branches are relatively softer. The only problem I have is getting blades that are 12 tpi (teeth per inch) or lower. Many blades are in the 18 and above range. The lower the tpi, the better so the teeth dig and cut through tree branch faster. 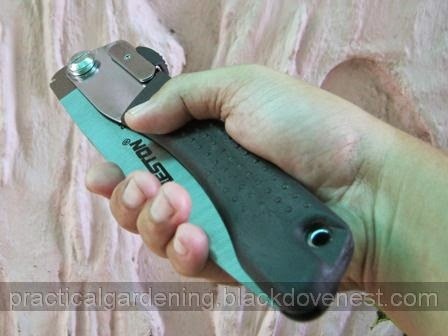 Again, I was looking for a garden tool that I could lug around for quick and dirty pruning jobs around the garden, and not appear like I was on to some carpentry projects. A pruning saw is the only answer for heavy limbs Pruning saws are handy in high and cramped places since they need only one hand. (lopping shears require two). Knife-cut surfaces are better than sawed surfaces because the smooth surface is less apt to rot and promotes faster covering by new growth. Pruning saws, unlike carpentry saws, are specially designed to handle green wood that causes conventional blade to stick and bind. To work well, they must have big, wide-set teeth to clear a path considerably wider than the blade itself. The bigger the teeth, the faster the cutting, but the rougher the surface. 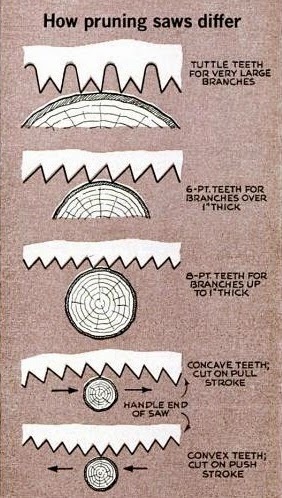 Eight-point teeth or 8 tpi (eight teeth to the inch) are about the smallest used in pruning and make the smoothest cut. Coarser six-point teeth are usually used on limbs over 1" thick to speed up the cutting, and some saws offer even faster four- and five-point blades. For very large branches, there are big, open teeth similar to those on lumbering saw. These are tuttle teeth and are the fastest-cutting of all. Saw teeth, shown actual size, are big for fast cutting of large limbs. On thin limbs, fine teeth are better since they cut more smoothly. Saws that cut on pull stroke are easier to handle overhead. Will not accidentally bend or fold when in use, thus preventing injury. To release this lock, press on the safety thumb lock then fold. From 17 inches long when in use, this will fold down to 9 inches when stored. At 2 inches wide and 3/4 inch thick, this can be slipped into your a garden apron pocket or your jeans' back pocket. At 7 tpi (teeth per inch), the aggressive tooth pattern cuts on the push and pull strokes resulting in fast, easy and smooth cuts. Used properly and wiped after every use, the blade will not rust easily. Lightweight and durable, the blade tapers towards the front allowing quicker work in tight spaces. The contoured shape of the handle facilitates pull out of the blade. 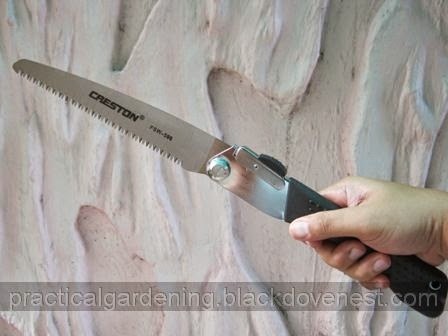 The handle's comfortable non-slip grip cushions and prevents blisters even with repeated pruning. Thanx. You may leave your comments or messages here.